Here is the final page in the design process. It met Bella's approval. I have several other sketches, one of which is going to grow up into another quilt! I do not have EQ7, but I might just get it with some Christmas money I received now that they have it for Mac. I just worry about another diversion that will take me away from my sewing machine. I knew I wanted to make blocks of scrappy squares. 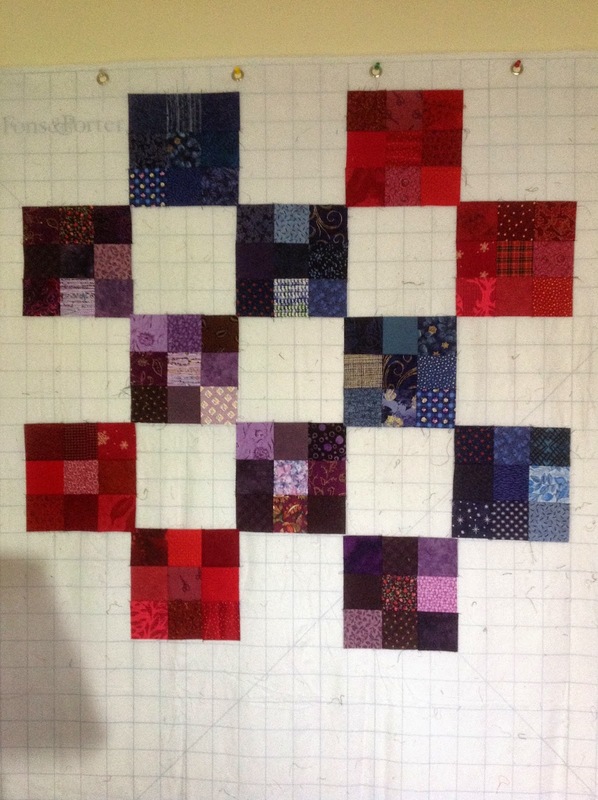 I'd cut a lot of 3" squares last summer in blues, greens, purples, and reds when I was cutting 2.5" squares for a couple of Cynthia's Scrap-a-Palooza quilts. Why 3"? I have no idea... why not? I think I had a bunch of 3" squares left from another project. Sorry for the poorly lit indoor pics. The person this quilt is going to has a special birthday coming up in February. He is also of Irish heritage, and very proud of it. A few weeks ago I was struck with the idea of incorporating an Irish chain pattern into the quilt. At that stage I'd still been thinking of turning the scrappy squares blocks into half-square triangle blocks and playing with the light/dark myriad of patterns using that combination. Could I do both? I decided not. 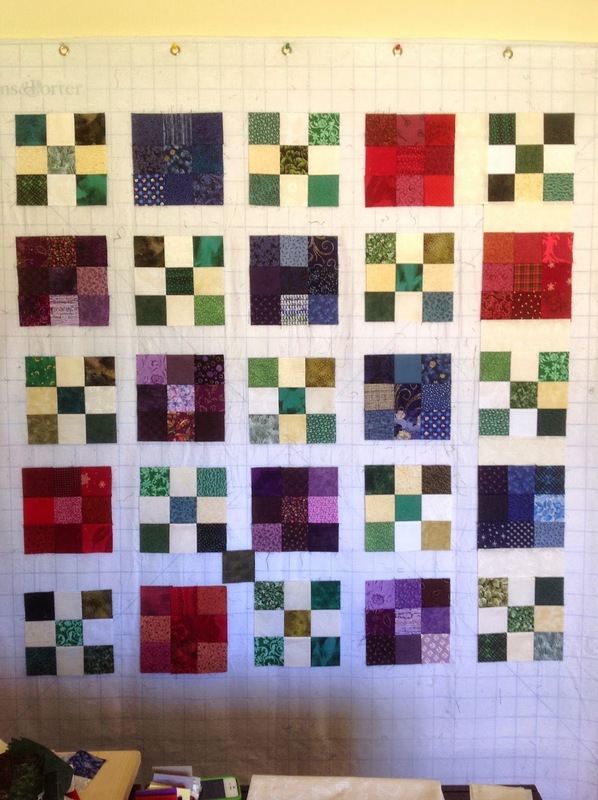 I didn't have many red squares cut, and not nearly enough green squares. Thank goodness for leftover scraps from Fleurs, and for a handful of red scrap chunks I'd thrown in my toolbox with the idea of perhaps making a red background Snowalong snowflake or two. I'd brought quite a few scraps and chunks of blues because of Scraps of Calm, and I had a handful of purples because of wanting to make a makeup pouch for a certain daughter. I did not have enough yardage of a neutral to use in the sashing (here yet again, is a woe from not being able to bring my entire stash; I have several potential pieces up North...) but at Alma Sue's Quilts I found the perfect fabric, ivory with white embossed(?) seaside images from P&B Textiles. 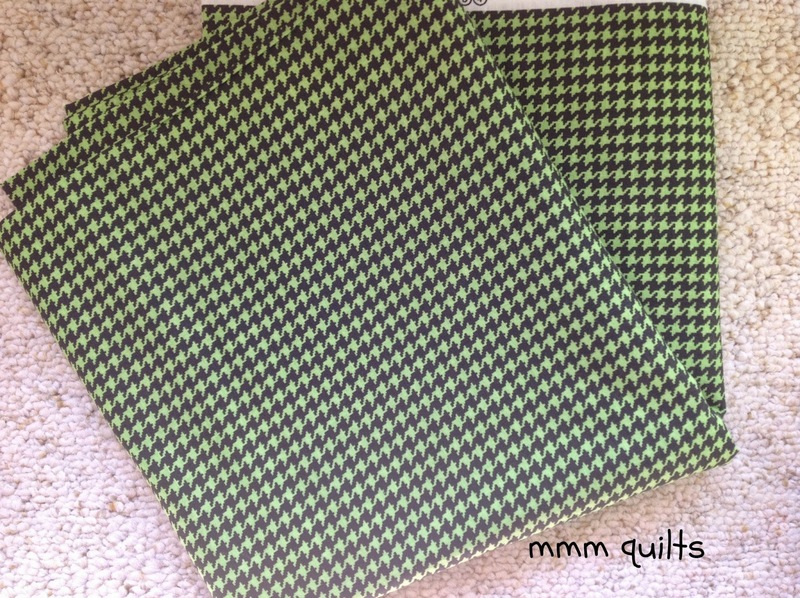 I also picked up a couple 1/4 yard pieces of $5/yard fabric in a kelly-green shade and this absolutely perfect Houndstooth (he has a dog, get it?!) fabric for the backing. Here is the current stage, with the sashing and cornerstones all sewn up. I've decided it needs a final green border. Sigh. You guessed it; I don't have anything down here that would work. Darn it all but I guess I have to make another pitstop at a LQS! So this quilt is partially scrappy, partially new fabric. 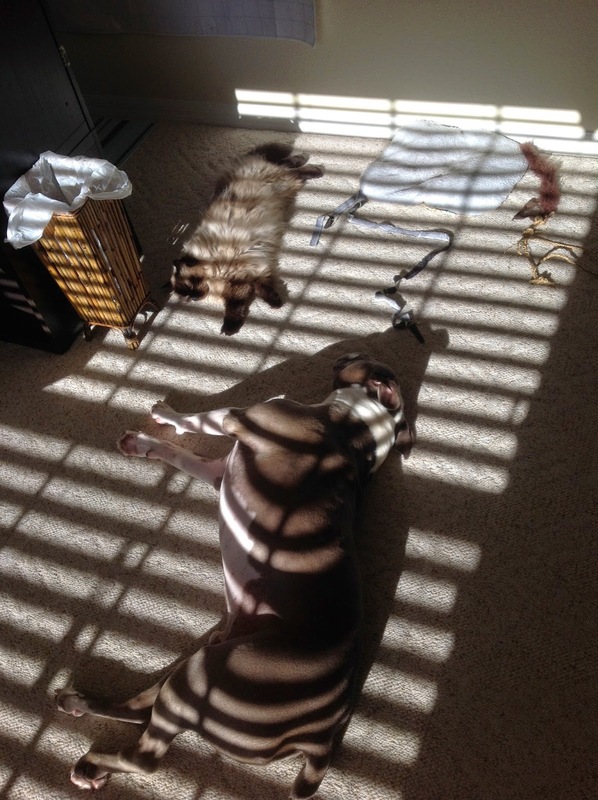 Rocco and Bella find symmetry in my sewing room! Harmony, peace, symmetry and a puddle of morning sunshine! So cool. I love seeing how this evolved. I know who you mean, who this is going to, and I believe it will be very well loved! It looks just beautiful so far! I like it very much; the Irish chain makes a perfect setting. I usually have to add new to old, but at least I do use some old. Great idea for an Irish chain Sandra! 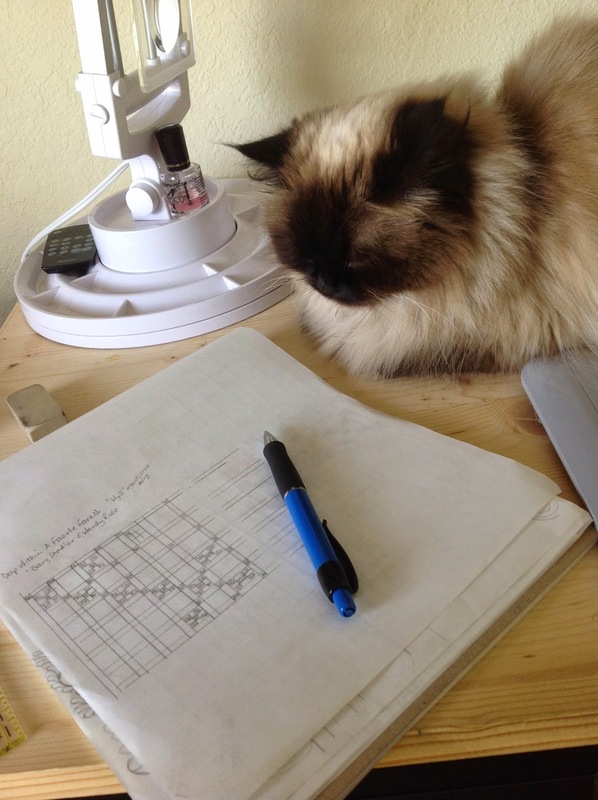 You know, I am pretty sure that Bella must have been a quilter in a past life... she always seems so fascinated by what you are doing. 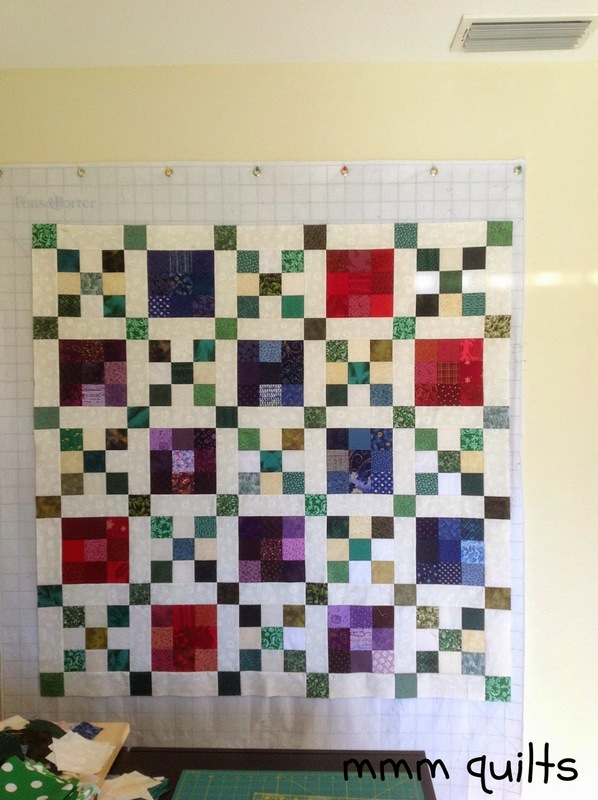 I love the combination of scrappy solid blocks with the Irish Chain. Great Idea. Yay for scrappy Irish Chain! Looks fabulous! Beautifully done. I like the green houndstooth for the back.